The International Space Station is the largest satellite in orbit. This file photo of the station was taken in May 2010 by NASA space shuttle astronauts. HOUSTON — The International Space Station suffered a problem with half of its vital cooling system Wednesday (Dec. 11), resulting in a partial power down of some non-critical systems, NASA officials say. According to a NASA statement, "at no time was the crew or the station itself in any danger." The six astronauts and cosmonauts on the orbiting laboratory went to sleep as regularly scheduled with no concern for their safety, the statement said. The ammonia system is one of several cooling loops that circulate liquids throughout the International Space Station. See how the space station's cooling system works here. By midday, ground controllers suspected that a flow control valve inside the pump might not be functioning correctly. NASA capcom (capsule communicator) Lucia McCullough described the "big picture" to the space station's crew during their normal daily planning conference call. "The [External Thermal Control System] Loop A is still running but the flow control valve doesn't appear to be positioning properly, so the Loop A is very cold," McCullough said around 12 p.m. EST (1700 GMT). "We're not expecting it to get warm enough for us to be able to reintegrate [Loop A] for heat rejection." McCullough told the crew that as a result of the Loop A shutdown, science experiment hardware and other space station systems inside the U.S. Harmony Node 2 module, European Columbus laboratory and Japanese Kibo laboratory would be powered down as they slept. "You'll keep half of [the power to] each module and that is why the crew quarters are not affected," McCullough radioed from NASA's Mission Control Center in Houston. Meanwhile, the space station's more critical systems are being cooled by Loop B, which is still functioning normally. "All the thermal loops have been shifted to Loop B, which is struggling to keep up, so we're going to be looking at some additional power downs in other modules to make sure that the highest priority loads get adequate cooling," McCullough told the crew. Ground controllers are continuing to troubleshoot the issue overnight, according to a statement posted to NASA's website. If the valve issue turns out to be a hardware problem, it may require that astronauts go outside the International Space Station at some point to replace the pump module with a spare unit. The affected 780-pound (355 kg) pump module was last replaced by station astronauts in August 2010 during three contingency spacewalks in response to a similar Loop A coolant system shutdown. In that situation however, the pump module itself had failed rather than the control of a valve, as currently suspected. The coolant system problem notwithstanding, as of Wednesday evening NASA and its commercial partner Orbital Sciences Corporation were still preparing to launch Orbital's Cygnus unmanned resupply spacecraft to the space station next Wednesday (Aug. 18) from the space agency's Wallops Flight Facility in Virginia. The Orb-1 mission is the first of eight cargo flights NASA has contracted Orbital Sciences to fly to the space station. 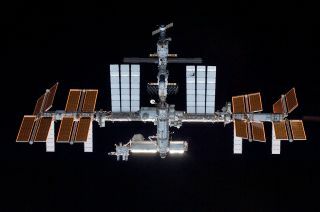 The International Space Station, which last month celebrated its 15th year in orbit, is currently crewed by its 38th expedition crew, including American astronauts Michael Hopkins and Rick Mastracchio, Russian cosmonauts Oleg Kotov, Sergey Ryazansky and Mikhail Tyurin, and Japanese astronaut Koichi Wakata.